Psychology provides several different frameworks for understanding human psychology. Naturally, these systems can be applied to our roleplaying characters. Whether you’re creating a new RP character and you need somewhere to start — or you’re trying to decide where an existing RPG character falls on these systems — it’s easy to fall down the rabbit hole. You might start out just reading about these psychological archetypes… and then suddenly find yourself trying to take Myers-Briggs personality tests as your roleplay character. Shh… I won’t tell! Game alignment systems are a great inspiration source for your RPG character, naturally. They were made for this kind of thing, after all. The DND alignment system is the most famous of RPG character alignment systems — but there are plenty out there! Most “honor/dishonor” karma type systems can be classified as alignments. They provide a framework for understanding — as well as planning — our characters’ actions. Basically all of literature consists of stock characters, archetypes, and repeating stories. That old saying about nothing being original isn’t too far off the mark. Wikipedia is a surprisingly in-depth resource for literary archetypes and stock literature characters — if you pay attention to the links in the footer and related pages boxes. These stock characters can help you with a barebones basis for your character, which you can then flesh out further. Astrology and traditional beliefs are an awesome source of inspiration for RPG character personalities. There are several different systems and a ton of different beliefs like birthstones out there. Maybe your character has a favorite flower, and associations with that flower also describe their personality? What about a favorite animal, or favorite star? There are many traditional belief systems associated with these preferences — chances are good that they can help you shape your RPG character’s personality, too. Birthstones sometimes have personality-related traits. If not, they can sometimes provide a cool association for your character. For example, maybe your RPG character born in July is obsessed with rubies and all things red. Wikipedia is a crazy amazing resource for pretty much anything. You should always check out Wikipedia as one of your first resources when investigating well… anything. The same goes for roleplay, of course. There’s a ton of information there perfectly applicable to roleplay! Sometimes, though, you don’t have a specific idea in your head — you’re just looking to browse. Perhaps you’re seeking inspiration for a new character, or you’re looking for some world-building ideas. If that’s the case, Wikipedia’s Categories feature can be a great thing. Instead of a specific search, page, or portal, categories offer a wide variety of pages sharing a common theme. These types resources are wonderful to investigate when seeking inspiration and ideas rather. Searches are designed to bring specific and exact resources to you. Categories, tags, and other taxonomy systems are designed to allow easy exploration of many different subjects. Culture by Ethnicity provides different modern cultures according to ethnicity. You can get seriously lost within a single subcategory here — there’s a ton of inspiration just waiting for you in these pages. Remember, when adapting something from an existing people, be respectful in your interpretation. Cultural History by Country is a great resource, similar to the culture by ethnicity but covering more historical ocurrences as well (as the name suggests). Archaeological Cultures is great for creating more primitive characters — you can look for customs, rituals, and traditions that died out many centuries ago. This is useful for a wide range of historical-type RPGs, as well as more esoteric applications. If you’re playing on a feral alien planet, where the aliens are characterized as being “prehistorical” — you can actually use the archaeological culture information in your feral alien RPG. It’s unlikely that something would be ported precisely from the archaeological culture to the alien culture, but inspiration is always a possibility! 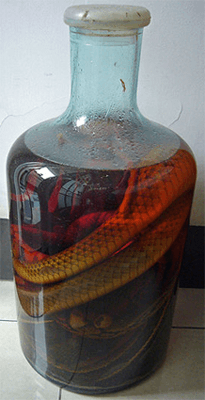 Characters or whole cultures that drink snake wine? Just one of the inspirations you can find on Wikipedia. Religious behavior and experience is a great resource if you’re creating a religious or spiritual character. Remember to be respectful if you’re creating exact parallels between existing and current religions and your roleplay. When you’re inspired by something, though, and you change it around appropriately — generally this is fine. Similar to the previous category, Rituals is a great category for religious or spiritual character creation. This resource is good for primitive-type characters, although rituals can appear in virtually any form of spirituality. If you need to create spiritual stories for your roleplay world, such as creation stories or explanations of gods and goddesses — Mythology is a great place to start. By looking at real cultures’ mythologies, you can craft better stories for your roleplaying game. Fashion is a great place to explore for your roleplay character’s appearance — if they’re human, anyway. It’s actually fairly tough to offer inspirations for this, given that there are so many different roleplaying character possibilities across so many different games! If you’re playing a creature that exists in reality, you might check Wikimedia Commons. If you play a horse RPG, for example, browsing the Horses category of Wikimedia may help you decide a new character’s appearance. Can’t find something to match your character? Check out the Roleplay Graphics tutorials. You can learn how to re-color an image to match your character. Okay, so this is an extra bonus — but how about the big daddy category, Culture? You can get literally anywhere in Wikipedia’s pages through this category! It may feel a little overwhelming if you’re looking for specific information — so Forum Roleplay recommends searching if you already know what you want. If you’re just seeking inspiration, though, browsing this category is a great way to get yourself going.